The IndyCar Series will return to Texas Motor Speedway but gone will be the track’s exclusivity provision. Texas Motor Speedway’s recently announced four-year contract extension with INDYCAR insures the Verizon IndyCar Series will be competing under the lights at the Fort Worth facility past the quarter-century mark, while also opening the door for the sanctioning body to race in potentially lucrative new Southwest markets. The extension covering 2019-2022 was announced by TMS President Eddie Gossage and INDYCAR CEO Mark Miles in separate but similar releases last week, albeit without key details featuring an “across the aisle” compromise in the spirit of Sen. John McCain. Specifically, TMS surrendered its long-standing regional exclusivity rights for a lower sanctioning fee. The DXC Technology 600 _ “America’s Original Nighttime IndyCar Race” _ will be run on Saturday, June 8, 2019 in the schedule slot two weeks following the 103rd edition of the Indianapolis 500. The TMS race weekend will mark the 23rd consecutive year the Verizon IndyCar Series has competed in Cowtown, dating to the venue’s inaugural season under the Indy Racing League banner in 1997. TMS’ 1.5-mile oval has played host to a series-record 30 races, including the season-finale on six occasions from 1999 to 2004. TMS and O. Bruton Smith’s Speedway Motorsports Inc. has operated with geographic regional exclusivity since 1997, although INDYCAR previously conducted a short-lived street race in Houston. Gossage said the exclusivity deal specifically covered the Austin and San Antonio markets in Texas, Oklahoma City, Okla., and Shreveport, La. “INDYCAR said they didn’t want to continue to do that (grant exclusivity),” said Gossage, referring to the negotiations with Miles, CEO of Hulman & Company, which owns INDYCAR and Indianapolis Motor Speedway. “I said, ‘We hitched our wagon to yours a long time ago and our company has spent more money than anybody with the Hulman-George family.’ No track organization, no TV network, nobody has spent the kind of money we have with the Hulman-George family. We’ve spent $100-million through the years in support of the Hulman-George family and INDYCAR racing. And we’ve spent another $30-million promoting INDYCAR racing. What better partner do they have? “When they said they wanted to do away with the geographic exclusivity, we said we can’t do that. They said, ‘Let us finish…and here’s what we’ll do.’ So they gave us a much, much, much better sanction fee that would free them up. And when they talked about markets like San Antonio, Oklahoma City and Austin, that protects us (from potential lost revenue). I thought it was a very fair thing to give us some insurance if we’re affected at the gate or with sponsorship if they have another event nearby. 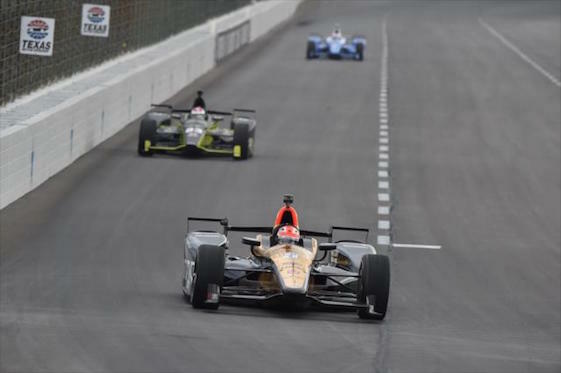 According to the Indianapolis Star, INDYCAR has confirmed 12 races for a projected 17-event 2019 schedule that will not include the 1-mile ISM Raceway in Avondale, Ariz., outside Phoenix. INDYCAR reportedly is negotiating with Circuit of The Americas near Austin, Texas _ site of the FIA’s Formula One U.S. Grand Prix in October _ for a late March/early-April race on its 3.4-mile/20-turn natural terrain layout to replace the Phoenix oval. Gossage never referred to Circuit of The Americas or COTA by name during his interview with RacinToday.com. The facility outside Austin is approximately a 220-mile/three-hour drive from the Dallas-Fort Worth Metroplex. “Phoenix definitely is out,” Gossage said. ”As far as Austin…they didn’t talk about Austin to me at all. In conversations with me _ several conversations on several occasions _when they talked about racing elsewhere, they talked exclusively about a San Antonio street race.” San Antonio, a 286-mile/four-hour drive from the DFW market, played host to a series of sports car street events sanctioned by the International Motor Sports Association (IMSA) during the 1980s. Gossage also reiterated his desire to return TMS to its previous slot as first race after the Indy 500, the crown jewel of domestic open-wheel racing. That schedule slot currently belongs to The Raceway at Belle Isle Park in Detroit, site of the Chevrolet Detroit Grand Prix doubleheader weekend. “We talked about that and I’m not talking about the week after the Indy 500, I’m talking about two weeks after, like it used to be,” Gossage said. That was a reference to TMS’ original series schedule slot _ which saw Gossage and the track’s media relations staff aggressively promote “Danicamania” after rookie Danica Patrick drove to an historic fourth-place finish in the 2005 Indy 500. “I think we (all the parties involved) need an off-week after Indy,” Gossage said.”Two races (and qualifying in a two-week period) is a grind on people, equipment and sponsors, many of whom don’t think past Indy. There was some talk about not going back to Belle Isle and I said if that gets undone, I do expect INDYCAR to live up to a ‘gentleman’s agreement’ (with TMS). But Detroit worked out their issues. “And just take us out of the picture. There needs to be an off-week for all kinds of reasons. I worked on the team side (in open-wheel public relations) and you can wreck a bunch of cars at the Indy 500 and at Detroit because of fatigue, not just of the drivers, but the crew members, etc. In conjunction with the sanctioning agreement, TMS announced that Irving, Texas-based DXC Technology, the world’s leading independent, end-to-end IT services company, will return as the race title sponsor. “It was cool to have DXC renew, so we got a sponsor built into it,” Gossage said. “They were easy to work with and I think we impressed them because they got more than they expected out of that race. They love the sport.” DXC also served as primary sponsor of Simon Pagenaud’s No. 22 Team Penske Chevrolet at TMS last June. Chip Ganassi Racing’s Scott Dixon, a four-time series champion, assumed the point lead with his victory at TMS in that race. Texas Motor Speedway has hosted 30 Indy car races since June 1997 and the infamous disputed outcome run under sanction of the U.S. Auto Club involving Billy Boat and Arie Luyendyk. That night was capped by team-owner and Indy car legend A.J. Foyt Jr. of Houston slapping Luyendyk to the ground in Victory Lane while Luyendyk protested Boat’s first series win. It was the moment that put TMS on the motorsports map. TMS hosted two series races a year from 1998-2004, a doubleheader on the same night in 2011 and a single race in all other years since 1997. TMS also boasts three of the nine closest finishes in series history, including the track-record 0.0080-second margin of victory when Graham Rahal edged James Hinchcliffe in 2016. It was the narrowest margin of victory at TMS and the fifth-closest on any Indy car track throughout history. Among tracks on the projected 2019 INDYCAR schedule, only the famed Indianapolis Motor Speedway oval (102 races), the street course in Long Beach, Calif. (35), and Mid-Ohio Sports Car Course in Lexington, Ohio, (34) have held more Indy car races than Texas Motor Speedway. The entire 2019 Verizon IndyCar Series schedule is expected to be announced in early September. The DXC Technology 600 race weekend will include its traditional companion race in the rebranded NASCAR Gander Outdoors Truck Series, the Rattlesnake 400, on Friday, June 7. With the return of the Verizon IndyCar Series in 2019, TMS’ schedule is solidified for next year. TMS will open next season March 29-31with the O’Reilly Auto Parts 500 tripleheader, featuring the Monster Energy NASCAR Cup Series, Xfinity Series and Gander Outdoors Truck Series. The Gander Outdoors Truck Series JAG Metals 350 will be held Friday, March 29, followed by the Xfinity Series My Bariatric Solutions 300 on Saturday, March 30, and the Cup Series O’Reilly Auto Parts 500 on Sunday, March 31. NASCAR will return in November 2019 for postseason action with the AAA Texas 500 doubleheader. Texas Motor Speedway will play host to NASCAR Playoff races Saturday, Nov. 2, with the Xfinity Series O’Reilly Auto Parts 300 and Sunday, Nov. 3, with the Cup Series AAA Texas 500. Additionally, the Tony Stewart presents the Vankor Texas Sprint Car Nationals will move from the spring weekend and be held Friday, Nov. 1, and Saturday, Nov. 2, at the Texas Motor Speedway Dirt Track.